Stockholm, Sweden — November 2015… Now in its 60th year, the Eurovision Song Contest is one of Europe’s most-watched events, with hundreds of millions tuning in across the Continent. The contest has launched the careers of such artists as ABBA and Celine Dion. Even before his triumphant win at the 2015 ESC, singer Måns Zelmerlöw was already a star in his native Sweden, with a decade-long career that spans recording, television and theater. Since winning Eurovision, Zelmerlöw has been expanding his base, touring throughout Europe and beyond in support of his current album, Perfectly Damaged. 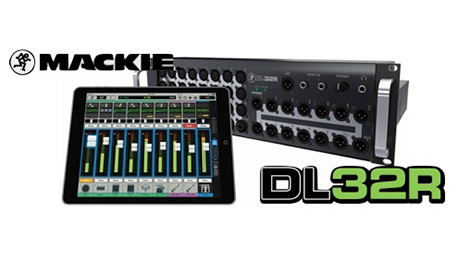 Handling FOH and Monitors on dual Mackie DL32R iPad® controlled digital mixers is Sebastian Meyer of Meyer Production Sweden. As Meyer observes, networking the two mixers via Dante has been a powerful and effective way to mix the five-piece band. Meyer even uses the DL32R to interface with his laptop running an external DAW. “I’ve got some nice high-end reverb plug-ins, and the DL32R enables me to connect my DAW and use it as an FX loop. It’s fantastic.” A hard disk connected to the second USB port captures a multi-track recording of each show. Meyer’s mix rig comprises dual iPad Minis on a small wedge. “I could run it all on one iPad or use both for a bigger display, but I like to have a different device for each one, so if someone wants to make a quick adjustment it’s all right there,” he offers. He keeps a larger iPad onstage for convenience, and gives each of the four backing musicians their own iPod Touch to control their individual monitor mixes.